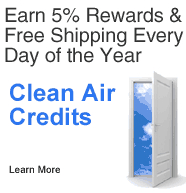 The Filter Factory has a reward program where points are earned for each purchase. They have a gift listing for redemption, including gift certificates. In addition to obtaining quality products, the points are an added value to your purchases. Q: did this gift certificate create a charge on my credit card, or is it paid by points I accumulated. how can I redeem the certificate?